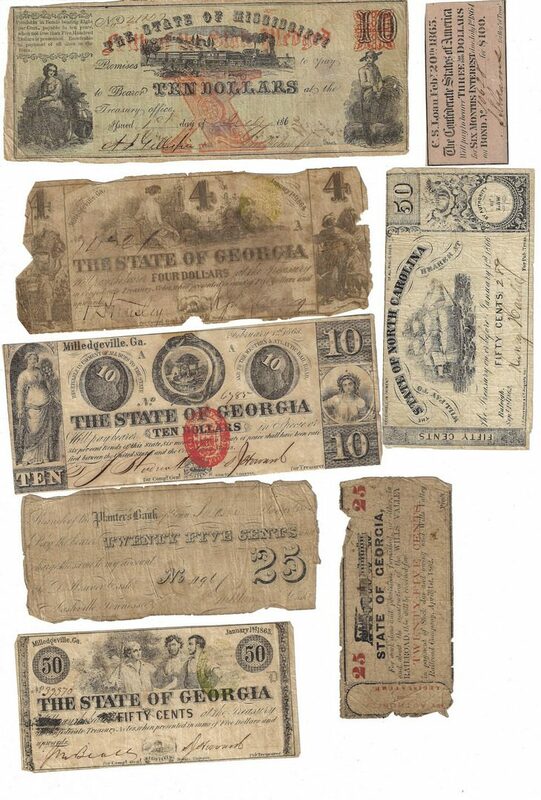 Twenty-Four (24) Obsolete/Confederate States of America (CSA) bills, one (1) Overton Fullton ALS, 25 items total. 1st item: One (1) State of Georgia $10 bill, issued in Milledgeville, GA, February 1, 1863, engraved by Howell, Savannah, GA. Classical vignettes, left and right, Georgia State seal, top center. Serial Number 6785/ pp A. Auditor/Treasurer signatures. 2nd item: One (1) State of Mississippi $10 bill, July 1, 1862. Vignettes of a maiden and a youth, left and right, vignette of a train, top center. Serial Number 21107. For Compr. General/For Treasurer signatures. 3rd item: One (1) State of Georgia $4 bill, issued in Milledgeville, GA, January 1, 1864, engraved by Howell. Agricultural vignettes, left and right, vignette of a goddess, top center, Georgia state seal, lower center. Serial Number 14721/ pp A. For Compr. General/For Treasurer signatures. 4th item: One (1) State of Mississippi $3 bill, issued in Jackson, MS, April 1, 1862. Vignette of a ship, left, vignette of a maiden in a sailor's uniform, lower right, vignette of a train, top center, vignette of a dog, lower center. Serial Number 5861. Auditor/Treasurer signatures. 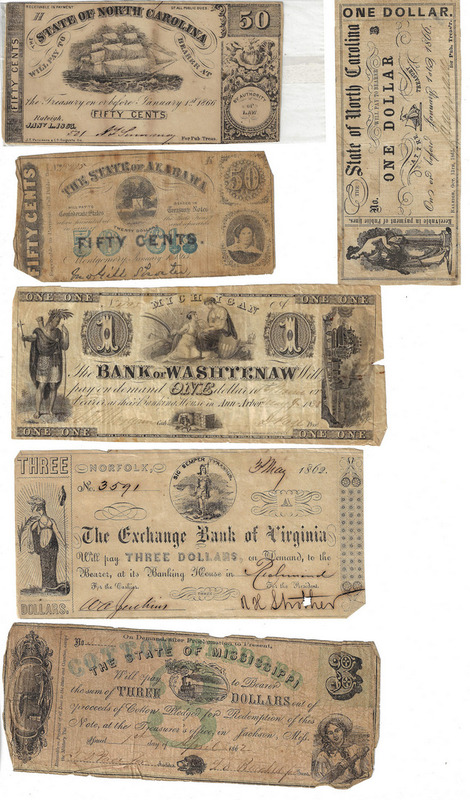 5th item: One (1) The Exchange Bank of Virginia $3 bill, issued in Richmond, VA, May 3, 1862. Classical vignette, left, Virginia state seal, top center. Serial Number 3591/ pp A. For Cashier/For President signatures. 6th item: One (1) State of North Carolina $2 bill, issued in Raleigh, NC, October 6, 1861, lithographed by F. W. Bornemann, Charleston, SC. Serial Number 1437/ pp D. For Public Treasurer signature. 7th item: One (1) The Bank of Washtenaw, Michigan $1 bill, issued in Ann Arbor, MI, May 9, 1835, engraved by Draper, Toppan, Longacre, and Company, Philadelphia, PA, New York, NY. Vignette of a Native American, left, vignette of an early train, right, classical vignette, top center, vignette of a dog, lower center. Serial Number 495/ pp A. Cashier/President Signatures. 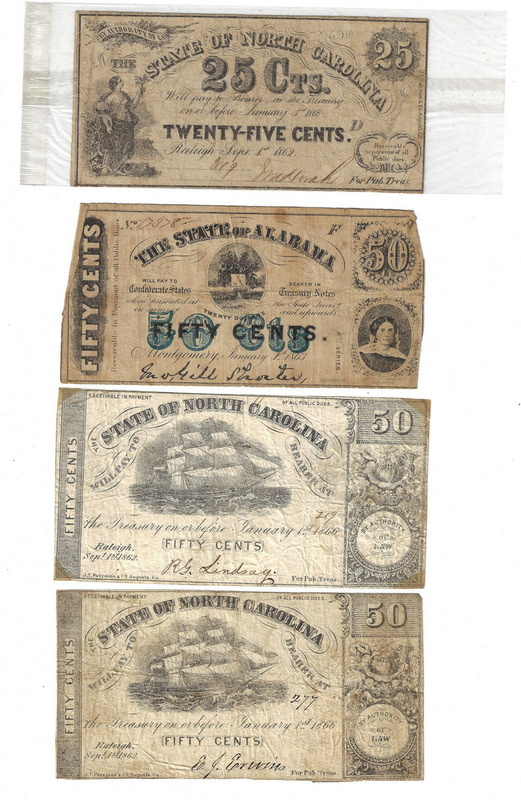 8th-9th items: Two (2) State of North Carolina $1 bills, issued in Raleigh, NC, October 13-14, 1861. Classical vignette, left, image of a ship, center. Serial Number 88/ pp B, 10300/ pp B. For Public Treasurer signatures. 10th item: One (1) State of Mississippi $1 bill, Jackson, MS, May 1, 1862. Vignettes of a maiden and a youth, left and right, vignette of a train, top center. Serial Number 184599/ pp. Auditor/Treasurer signatures. 11th item: One (1) State of Georgia $1 bill, issued in Milledgeville, GA, January 1, 1863, engraved by Howell. Vignette of a train, top center. Serial Number 9815/ pp C. For Compr. General/For Treasurer signatures. 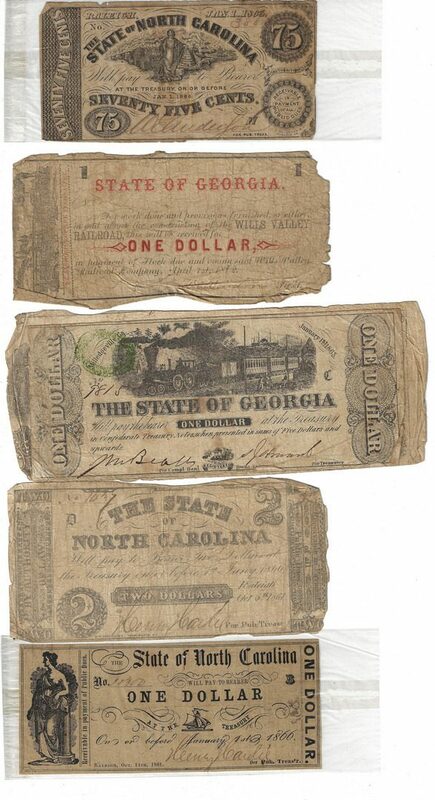 12th item: One (1) State of Georgia, Wills Valley Railroad Company $1 bill, April 1, 1872. Vignette of a train, left. President signature. 13th item: One (1) State of North Carolina 75 cents fractional note, issued in Raleigh, NC, January 1, 1863, engraved by J.T. Paterson & Co., Augusta, GA. Vignette of Industry with a beehive, top center. Serial Number 388/ pp M. For Public Treasurer signature. 14th-17th items: Four (4) State of North Carolina 50 fractional notes, three (3) September 1, 1862, one (1) January 1, 1863, issued in Raleigh, NC, engraved by J.T. 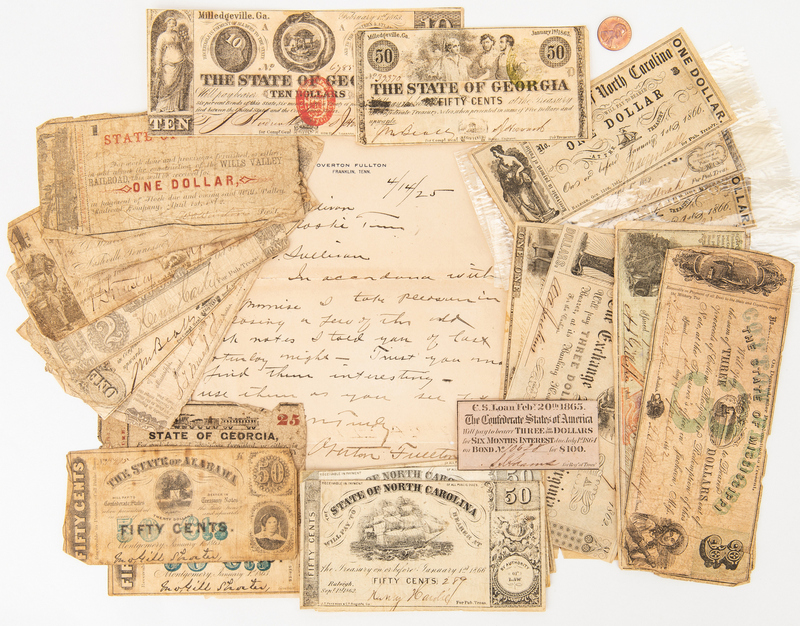 Paterson & Co., Augusta, GA. Vignette of a sailing ship, top center. 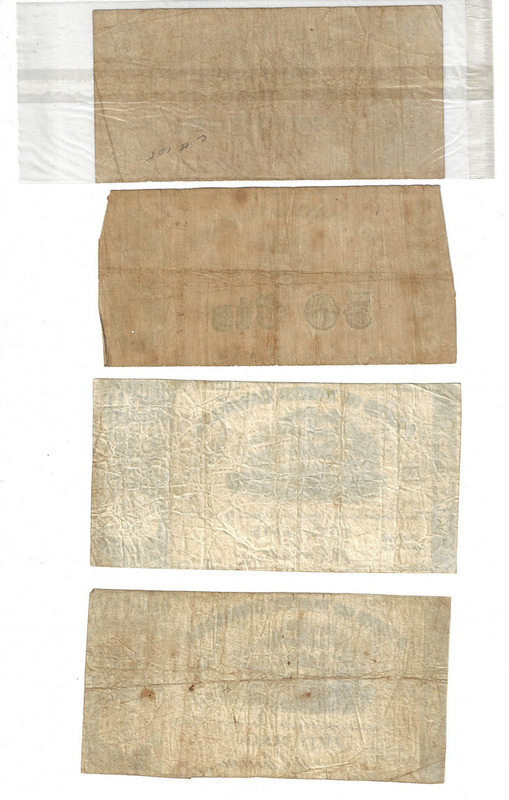 Three (3) September 1, 1862 bills. Serial Number 219, 277, 289. 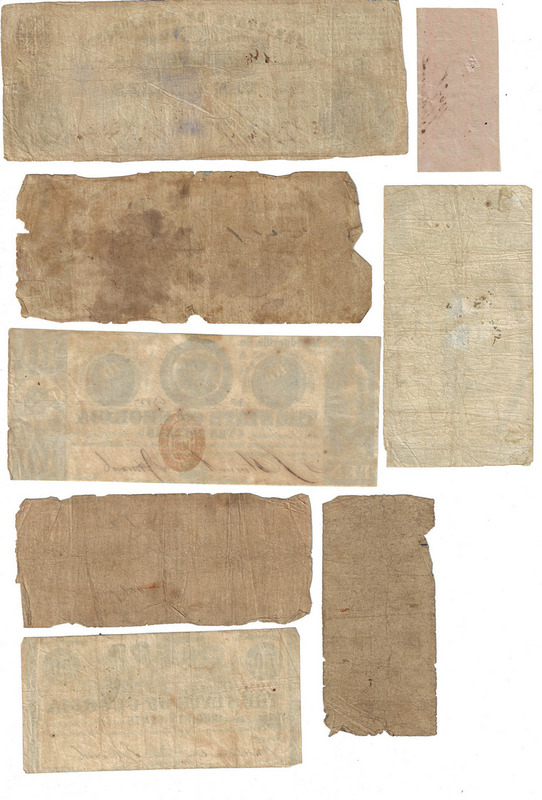 One (1) January 1, 1863 bills. Serial Number [blank]/ pp H. For Public Treasurer signatures. 18th-19th items: Two (2) State of Alabama 50 cents fractional note, issued in Montgomery, AL, January 1, 1863, engraved by J.T. Paterson & Co., Augusta, GA. Vignette of the map of Alabama on a tree, top center, portrait of Lucy Pickens, the "Queen of the Confederacy", lower right. Serial Number 17378/ pp F, 15495 pp K. John Gill Shorter, Governor facsimile signature. 20th item: One (1) State of Georgia 50 cents fractional note, issued in Milledgeville, GA, January 1, 1863, engraved by Howell. Vignette of three men, top center. Serial Number 39370/ pp D. For Compr. General/For Treasurer signatures. 21st item: One (1) Planters Bank, Pulaski, Tennessee 25 cents fractional note, issued in Nashville, TN, January 2, 1862, Dan Adams, Nashville, TN. Serial Number 1196. Cashier signature. 22nd item: One (1) State of Georgia, Wills Valley Railroad Company 25 cents fractional note, April 1, 1862. Vignette of a train, top center. President signature. 23rd item: One (1) State of North Carolina 25 cents fractional note, issued in Raleigh, NC, September 1, 1862, engraved by J.T. Paterson & Co., Augusta, GA. Vignette of a goddess, lower left. Serial Number 319/ pp D. For Public Treasurer signature. 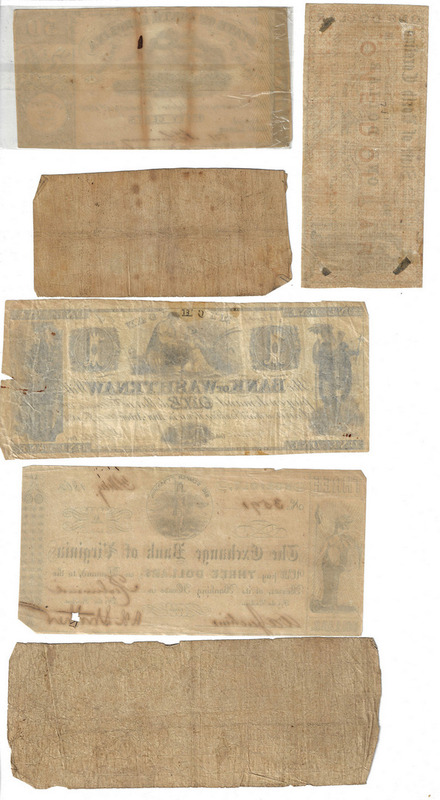 24th item: One (1) Confederate States of America (CSA) Loan coupon, February 20, 1863. Coupon reads "The Confederate States of America Will pay to bearer Three 50/100 Dollars for Six Months Interest due July 1st 1864 on Bond No. 10628 for $1000". For Register of Treasury signature. 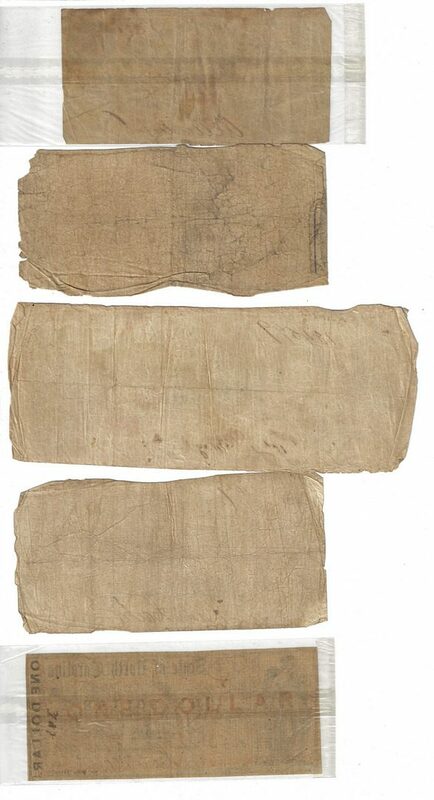 Bills range in size from 1 5/8" H x 3 1/8" W to 3 1/8" H x 7 5/8" W. Early/mid 19th century. 25th item: ALS. One page handwritten letter. From Overton Fullton, Franklin, TN, to Mr. M.D. Sullivan, Pulaski, TN, April 14, 1925. 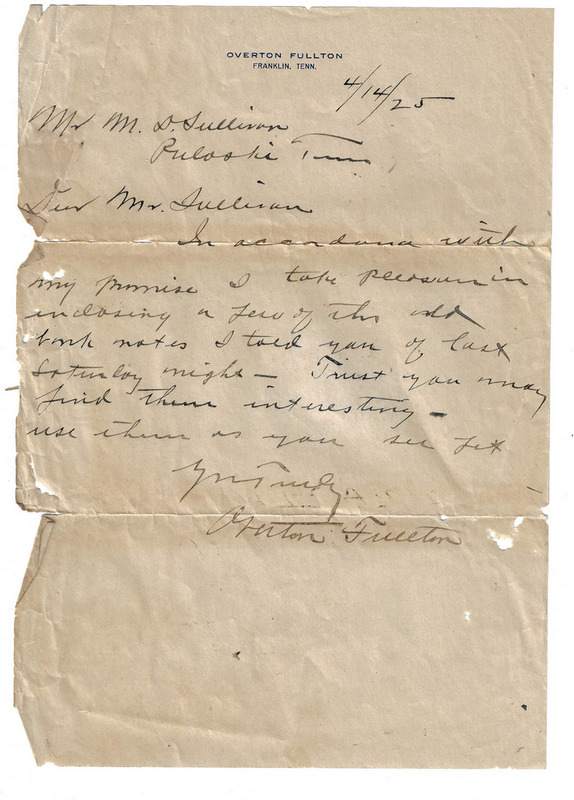 Fullton references some obsolete bank notes that he is sending to Sullivan writing "In accordance with my promise I take pleasure in enclosing a few of the old bank notes I told you of last Saturday night–Trust you may find them interesting–use them as you see fit–Yours Truly– Overton Fullton". 10 1/8" H x 7 1/8" W. Early 20th century. Provenance: the collection of Benjamin Dysart, Brentwood, Tennessee. CONDITION: 1st-24th items: All bills in circulated condition. 25th item: Overall good condition with some insect damage, tears, to letter. 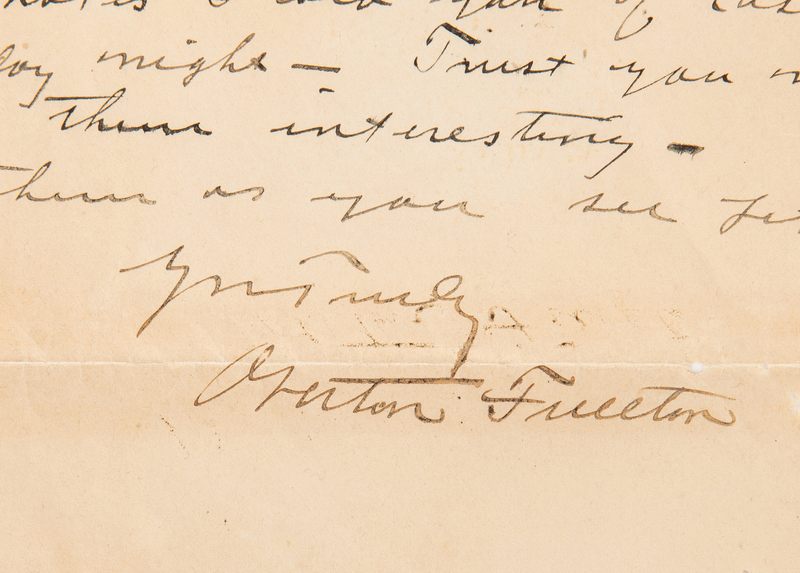 Fullton signature in good condition.